Dr. Patel is board certified in Pain Management and Anesthesiology. She completed both her Interventional Pain Medicine fellowship and Anesthesiology residency at the prestigious Columbia University Medical Center-New York Presbyterian Hospital. Dr. Patel specializes in the treatment of back and neck pain caused by arthritis, degenerative disc disease, spinal stenosis and pain following spine surgery. She also has expertise in treating neuropathic pain, cancer related pain, Reflex Sympathetic Dystrophy (RSD), atypical facial pain, pelvic pain, headache and peripheral neuralgias. Dr. Patel offers a variety of treatment options to help eliminate pain intractable to previous therapy, including epidurals, nerve blocks, radiofrequency ablation and the latest minimally invasive spine procedures. 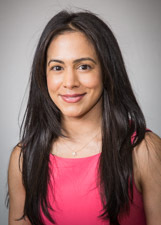 To expand the breadth of treatment options offered to her patients, Dr. Patel completed training in medical acupuncture at Harvard Medical School and Brigham Women's Hospital. She is certified by the State Medical board of New York to practice Medical Acupuncture. Dr. Patel's practice philosophy is to blend medical innovation, evidence based medicine and compassion to meet each patient's individual goals. She strives to improve functionality and allow patients to resume an active lifestyle. Dr. Patel believes that the treatment of pain is not only a physical issue but an emotional one as well. She offers patients the personal time and care that is needed to thoroughly evaluate their pain and provide them with the most appropriate treatment. As a result of her commitment to patient care, Dr. Patel was the recipient of the 2009-2010 Society for Education in Anesthesiology-Health Volunteers Overseas Traveling Fellowship, a grant to teach Anesthesia and Pain Medicine in the developing world. Dr. Patel has also been involved in patient advocacy through medical broadcasting and documentaries in Africa and India. Lenox Hill Hospital's Dr. Kiran Patel finds promise in a study that shows stimulating a specific set of nerves may cut the need for opioids. Having surgery can be frightening in and of itself. But, imagine waking up mid-procedure. Dr. Kiran Patel and Dr. Matthew Lorber, physicians with Lenox Hill Hospital, explain anesthesia awareness and the trauma that can follow.